I know it seems too early for this but it is never too soon to be prepared. I like to start pulling things together a few weeks before finals start so that I am not scrambling last minute to get the things I need from the store or find them in my house. 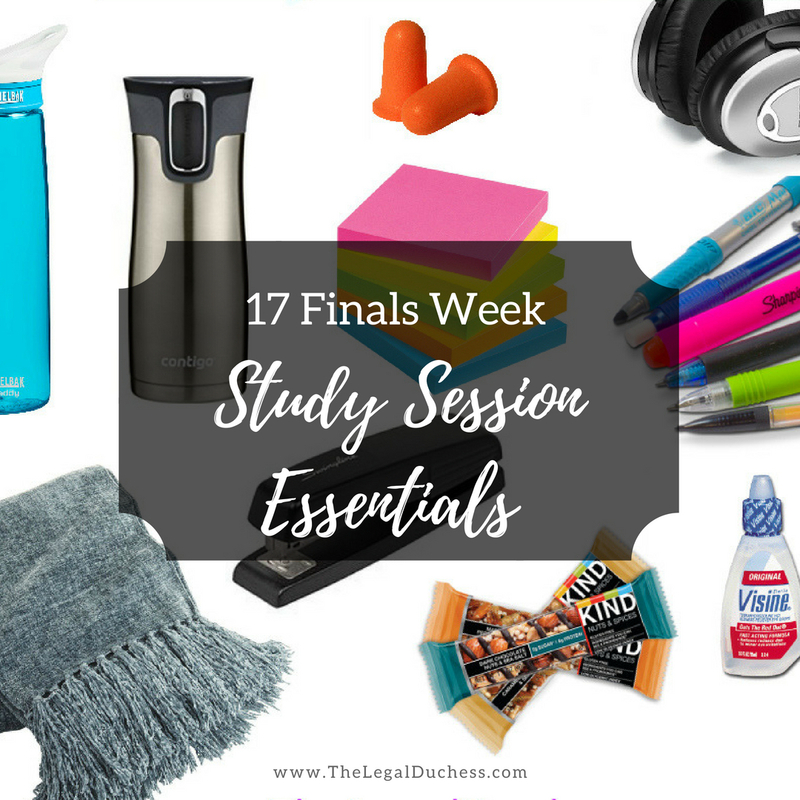 Finals are hard... having the right materials for marathon study sessions in the library helps to make it easier. There is a lot of necessary items beyond books, notes, and computer. Here are my must-have items in my bag during finals. I have a pair of Bose NC headphones and they are a lifesaver during finals. Blocks all the noise and allows me to hear nothing by my movie score playlist while I study. The Bose are great but they are pricey- here are some reasonable alternatives. Study rooms can get very cold and I personally am always cold. I like to carry a small throw blanket with me in case of chills and it also helps me to feel cozy and comfy wherever I am. This will double as a seat softener if you have uncomfortable library chairs. I snack constantly while studying.... this is good and bad. It keeps me stimulated (good) but it is easy to reach for unhealthy snacks (bad). I stock my bag with KIND bars, fruits, veggies and popcorn to stave off the munchies while staying healthy. Drinking enough water is a big key to staying healthy and feeling great. I keep a full Camelbak next to me at all times when studying. I feel that it makes me more awake. I also down caffeine like it is my job during finals so this is a must. I have two favorites: my Contigo no spill and my RTIC tumbler. Both keep drinks hot foreverrrrrrr and the no spill feature on the Contigo is a big plus when using it around books and laptops but the RTIC hold so much coffee. I am a huge flashcard learner. I go through them like crazy during finals so I start stocking up early. I prefer pastel colored cards and those can be a little hard to find. These are the best for writing things out, rewriting, drafting rule statements, etc. I love the lack of a spiral messing with your writing. I am weird- I only like white legal pads; no yellow!! I keep chapstick, hand cream, hair ties, body spray and a hair brush in a little bag inside my larger bag. It helps to keep me comfortable and feeling good. I know the body spray seems odd but there is a method to my madness- last semester we went to a study room to find that the previous user had forgone a shower to study; it smelled awful. Thankfully I had my little body spray in my bag and it saved our nostrils. You never know what weird smells you may encounter during finals time- people tend to put studying ahead of hygiene (ew) so be prepared. The best investment ever. I use earplugs during my finals to block out all the sounds- typing, sneezing, coughing, heavy breathing- you name it, I don't want to hear it. You can pick up these little foam plugs cheap and they are pretty comfy. It is a huge help with focus. I like to be organized and all the various paper while studying can get messy. I carry a small stapler and 3-hold punch to be able to keep everything organized and in the binder. I keep my planner with me at all times to make sure I know what I need to do and where I need to be. For more info on my preferred planner, check out this post. Long study sessions = dead technology. I have my computer charger with me at all times as well as one of these little universal chargers and a USB block so I can stay charged up and ready to go. With the organized trend, sticky notes and tabs help me to keep all my papers straight and jot down notes of questions I need to ask, things to look up later, etc. Overall, a must have for study time. Studying often leads to headaches and nobody got time for that. I keep a little bottle of ibuprofen (but it can be any preferred pain reliever so long as it does not induce drowsiness) for just such occasions. Reading for long periods of time makes my eyes and contacts super dry. I keep some eye drops to keep them comfortable. I also try to wear my glasses more during finals because my eyes don't get as dry as they do with my contacts. I wrote a whole post on this- check it out here. If you haven't noticed, there is a trend of color coding in my study tactics. Pens and highlighters are no exceptions- I mark all over my papers in a variety of colors. Here are a few of my favorite pens and highlighters. All of these goodies go in my backpack and/or purse and I am ready for study marathons in the library. 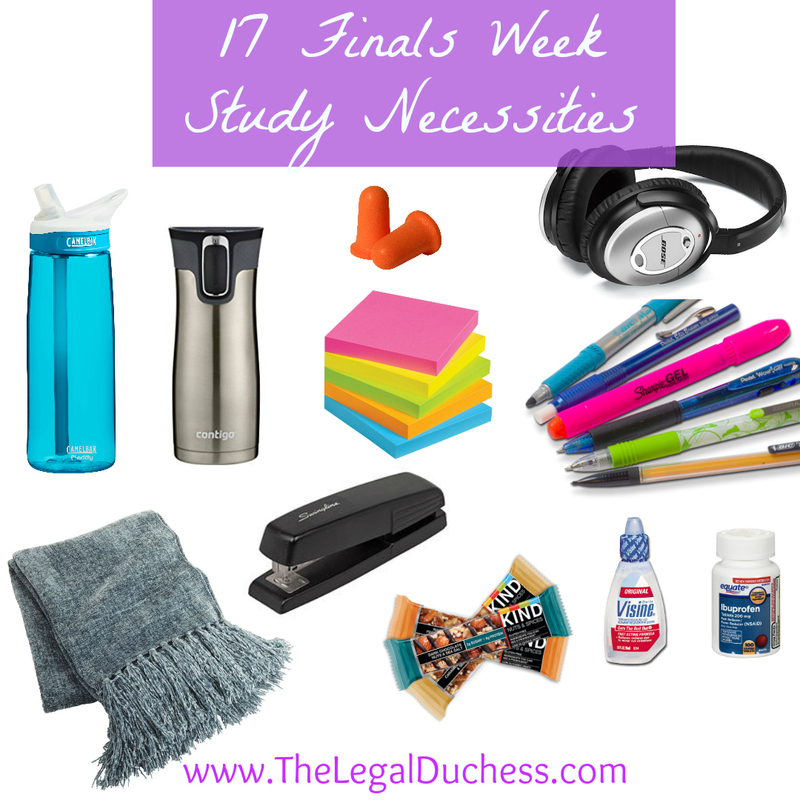 What do you have to have during finals?